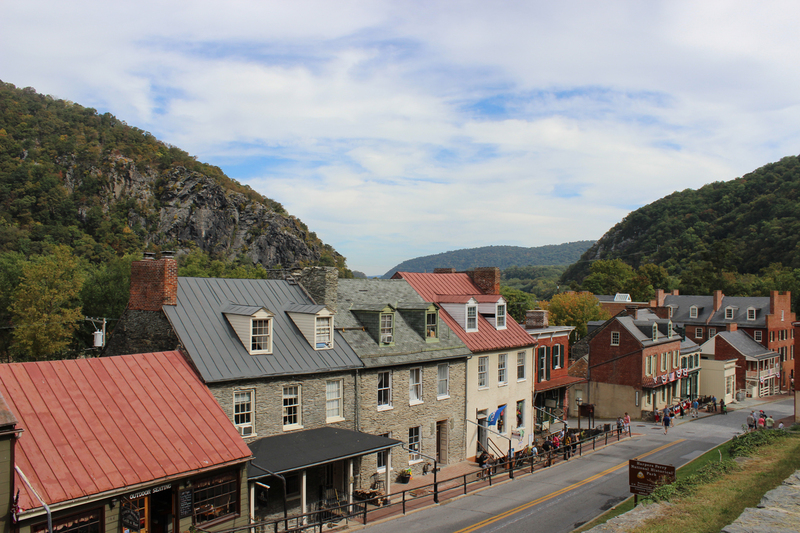 Harpers Ferry is a beautiful, old town that seems made up. Like many historic colonial places, re-enactors live among actual current day folk. I had always remembered Harpers Ferry as just that, a town re-created or preserved to help educate people on its history. Maybe that’s true, but there are actual residences right down town which I do not recall. It seems a strange place to make a home, living among tourists and historians, but it is right on the confluence of the Shenandoah and Potomac Rivers with beautiful views anywhere you look. But still. Because this place is so strongly rooted in my childhood I am rushing Larry around from point to point to ensure he sees everything, and constantly checking in with him to make sure he loves it as much as he’s supposed to. I did this to him in Washington DC too a few years back. I realize my fervor and back off. He will have the experience he’s supposed to have, all on his own. I take him down to the river. Here it is wide and shallow, just as I remember it. It is here that my family spent hours wading in the river and stepping on stones across the narrowest parts. It is here my memories are strongest. Today there are horses along the path and we stop to admire them for just a moment before I charge ahead to the place on the map where West Virginia, Virginia and Maryland meet. It is actually in the middle of the converging rivers so we must be content to merely see all three states simultaneously. And read the sign to prove it. Harpers Ferry is right on the Appalachian Trail. There is a sign informing hikers how far they have come, if that started at the trail head in Maine and how far they have left to go, if they are to complete it, in Georgia. At this point they are nearly midway. Just beyond the trail sign there is a footbridge that crosses the river. It is separated from the adjacent to the railroad tracks by a chain link fence. We follow the crowds and walk across the bridge. It affords a beautiful view of the gentle rapids below. From here we see a few rafters meandering down the river, three people are climbing a pretty steep rock face and others are simply enjoying picnics on the river’s banks. We loop back around and make our way toward the brick buildings that house everything from museums and bookstores to restaurants and residences. The hills are steep here, once covered in cobblestone, most are paved now. We peek into several of the exhibits depicting life in colonial times. I have seen so many of these exhibits I feel I could describe them without even looking: earthen floors, rough-hewn wooden dining table, two wooden chairs by a large fireplace used for warmth and cooking, giant copper pots. And probably a rudimentary broom propped in the corner. Maybe a candle on a small table next to a book and some spectacles. Always makes me appreciate sofas and electricity. Up one of the hills we find a little lunch counter. We’re all set to order sandwiches when a completely innocent child walks by with a milkshake. I never have milkshakes, but apparently I am on the nostalgia tour so this becomes my lunch. Don’t judge. From our tiny restaurant we cut through to a mostly residential street. There are shops and restaurants cut into the terrain with cantilevered decks for observation and dining on one side of the street and town homes rising up, hugging the mountain on the other. It’s lovely, still full of colorful flowers. As we continue on, we discover a place I had not been before. We hike up a hill to an old cemetery, past some ruins, a 200-year-old church and a caretaker’s home. Ringed in ledge stone, the graveyard is a rounded hill with plain white markers dating back hundreds of years. The headstones are all a little crooked, having settled over time. We lean up against the stone wall contemplating our country’s history – or maybe just resting in the shade. Behind us, we find a stone walkway back down the other side. Along this walkway we come upon a giant stone that is precariously suspended on a ledge and held in place by a few smaller boulders. A sign asks that we not climb on it or try to push it over. Noted. It is Harpers Ferry’s answer to the Chicago Bean. It lacks the reflective surface but not the photo appeal. Tourists rotate through handing off phones and cameras to strangers to be photographed in front of it. We examine each side of the big rock, yep, it’s a rock, then continue down the mountain. The view of downtown Harpers Ferry from this vantage point is beautiful. The church comes into view and beyond it the town, the river, the mountains. Postcard. Our time is being compressed. We have a shuttle to catch and at least another hour on the road to Harrisburg. We could stay here long into the evening hours, just lingering by the river or taking our time absorbing its history. But not today. On our way, we pass a little gift shop.Outside, a soldier stands sentry. Having passed from north to south and back no less than eight times during the civil war, his uniform is devoid of any decoration or identification. What he is, is a photo-op. Serious, staring unblinking into the middle distance, he is not as steadily stoic as a Palace Guard; he will break character just the slightest bit to be photographed with someone. Occasionally he nods. Never speaks, rarely smiles. A re-enactment of some sort is staring along the river. Grown men in costume are wearing and playing snare drums strapped to their shoulders. I am struck by how much has changed in our world in the past couple hundred years. Men such as these would drum different cadences to inform soldiers. Waking them up, calling them to meals, running women out of camps and calling them to battle. So much about war has changed since then. Soldiers would advance in rows with rifles held steady, actually making eye contact with those they were about to kill. Today we are working on perfecting chemical war fare and using humanless aircraft to decimate areas where the enemy may lurk. But I digress, this is not about war or politics. It’s about men in knee-high socks with big buckled shoes. I am grateful fashion has taken a more relaxed path. The day has been perfect. 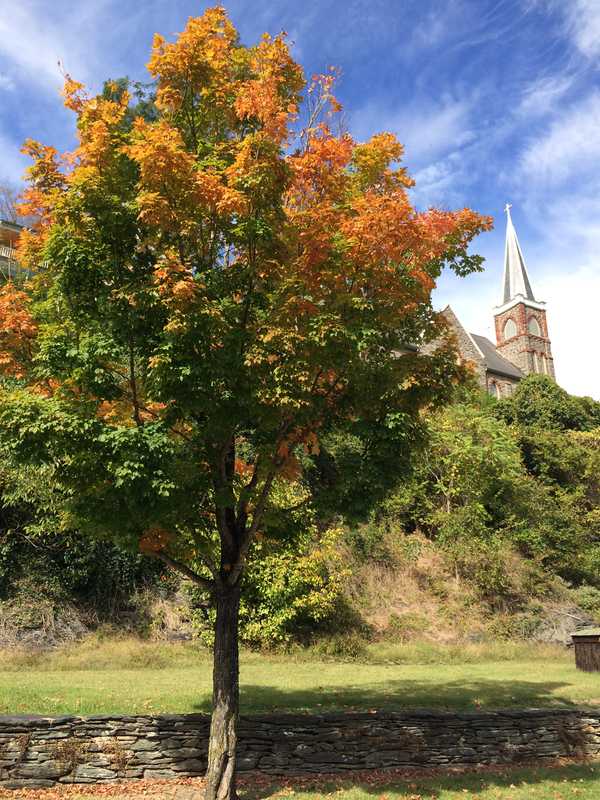 The weather is somewhere in the mid 70s with blue skies and just the right amount of changing foliage to make me believe it is fall somewhere. The air here is light and clean. but we have seen all there is time to see so we await the next shuttle back to the parking lot. Onto our next stop: Familyville.